Citation: Taylor, G. J. (August, 2017) Meteorite Formation Times and the Age of Jupiter, PSRD, http://www.psrd.hawaii.edu/Aug17/formation-times.html. --- Isotopic analyses of meteorites and models of planetary accretion indicate that Jupiter's solid core had accreted only one million years after the Solar System began to form. Different groups of meteorites have distinctive isotopic compositions. In a 2011 paper, Paul Warren (University of California, Los Angeles) showed that there is a clear dichotomy in chromium and titanium isotopic compositions between carbonaceous chondrites and all the other types of stony meteorites, plus Earth, Moon, and Mars. Thomas Kruijer (Lawrence Livermore National Laboratory, California and University of Münster, Germany) and colleagues at the University of Münster now show that the dichotomy involves iron meteorites as well as rocky ones. The two distinct groups were nicknamed the CC (those with isotopes like carbonaceous chondrites) and NC (those with isotopes like non-carbonaceous meteorites). Kruijer and colleagues were able to determine the time of core formation in the planetesimals in which iron meteorites formed and report that CC iron meteorites formed 2.2 to 2.8 million years after CAI formation, whereas the NC iron meteorites formed earlier, before 1.8 million years after CAIs. (CAIs, calcium-aluminum-rich inclusions, are the first solids to form in the Solar System and give us a time-zero reference marker.) The accretion of the planetesimals preceded core formation. Thermal calculations done by Kruijer and colleagues indicate that NC objects accreted at 0.4 million years after CAIs. In contrast, the CC objects accreted at 0.9 million years after CAIs. 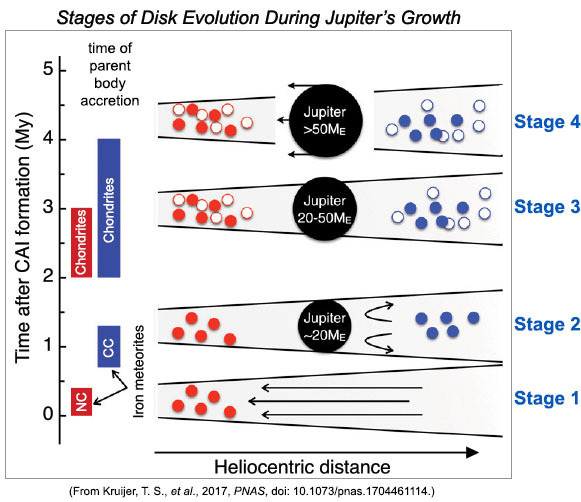 Kruijer and colleagues suggest on the basis of their results and published models for the formation of Jupiter that the dichotomy resulted from Jupiter's formation. The NC materials accreted when there was a continuous gas disk characterized by solids flowing inwards towards the Sun. However, less than a million years later, something interrupted this continuous flow, leading to formation of the isotopic dichotomy. Kruijer and coworkers suggest that rapid accretion of Jupiter's solid, mostly rocky core was the event that disrupted the continuous inwards flow. Models suggest that Jupiter would have grown to about 20 Earth masses, after which it grew by accreting gases to it. The ages of the NC and CC iron meteorite groups indicate that Jupiter's rocky core formed about 1 million years after CAIs. Sophisticated models for planetary accretion predict early formation of the rocky core of Jupiter, but suggest this process took between 1 and 10 million years (after CAIs). Quantitative meteorite data show that the time was around a million years, providing useful input for improving the models and showing the value of combining theory with data on ancient samples. PSRDpresents: Meteorite Formation Times and the Age of Jupiter --Short Slide Summary (with accompanying notes). Cosmochemists have produced a vast database on the textures, mineralogy, chemical composition, and isotopic composition of rocks from numerous asteroids, Mars, the Moon, and Earth. Numerous samples come from asteroids, represented as different types of meteorites, from stones to iron. Chondrites are themselves complicated, but fall into two major groups: carbonaceous chondrites and non-carbonaceous chondrites. Each group has numerous subgroups. Carbonaceous chondrites originally got their name because they contain carbon-bearing compounds, including organic compounds. As studies of carbonaceous chondrites evolved, meteoriticists defined new groups based on chondrule abundances, oxygen isotopic composition, and overall chemical composition. Ironically (and somewhat confusingly), many of the new carbonaceous chondrite types are not rich in carbon. In fact, the ureilites that plot in the NC group contain 3 wt% carbon! This is quite a menagerie of rock types, but in a paper published in 2011, Paul Warren (University of California, Los Angeles) brought some order to it. 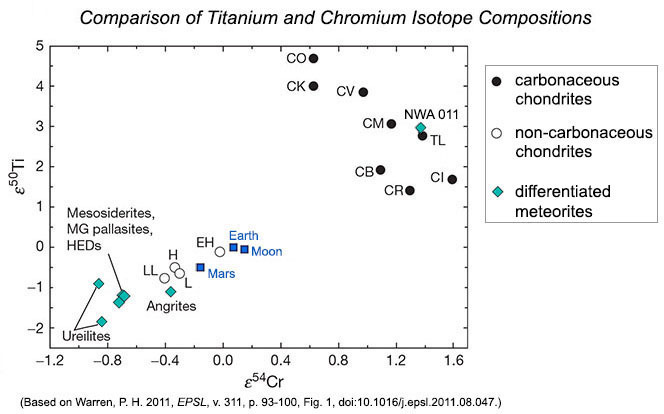 Using published data by others, he showed that the isotopic compositions of titanium, chromium, and oxygen in meteorites fell into two distinct groups (see diagram below). The carbonaceous chondrites differed in titanium and chromium isotopic compositions compared to the non-carbonaceous chondrites. Besides showing that the data fall into two clear-cut groups, Warren pointed out that it is not only chondrites that fall into the two groups, differentiated meteorites plot in the same two regions, too, and that the three large planetary bodies (Earth, Mars, and the Moon) plot in the non-carbonaceous group. The differentiated meteorite in the carbonaceous group is Northwest Africa (NWA) 011, an igneous basaltic rock [Data link from the Meteoritical Database]. Paul Warren emphasized the importance of these diverse materials in understanding accretion of the planets, and speculated that carbonaceous planetesimals accreted in the outer Solar System while non-carbonaceous planetesimals accreted in the inner Solar System. Plot of the epsilon values (ε) for titanium-50 (50Ti) versus chromium-54 (54Cr) in numerous asteroidal meteorites, Martian meteorites, lunar samples, and Earth rocks. The epsilon value is 50Ti/47Ti in a sample divided by 50Ti/47Ti in a terrestrial standard, expressed in parts per ten thousand; it shows the deviation from Earth values. Similarly, ε54Cr is the 54Cr/52Cr ratio in a sample divided by this ratio in a terrestrial standard, also expressed in parts per ten thousand. The carbonaceous chondrites and NWA 011 are distinctly enriched in both ε50Ti and ε54Cr compared to the non-carbonaceous chondrites, several types of igneous meteorites, and samples from Mars, the Moon, and Earth. This clustering may represent formation in the inner versus outer Solar System. The dichotomy that Paul Warren's analysis revealed did not include iron meteorites, almost all of which formed when asteroids melted sufficiently to form dense metallic cores. Thomas Kruijer and coworkers solved that problem by analyzing molybdenum (Mo) and tungsten (W) isotopes in 16 iron meteorites from five different iron meteorite compositional groups. This builds on work reported in 2011 by Christoph Burkhardt (then at the Institute of Geochemistry and Petrology, Zürich, Switzerland) and others in Zürich, Germany, and France. Burkhardt and colleagues measured molybdenum isotopic compositions in chondrites, differentiated meteorites, and 11 groups of iron meteorites. The molybdenum data show the same carbonaceous and non-carbonaceous groupings as Paul Warren found, but now supported by data from iron meteorites (see graph below). Kruijer and colleagues use the abbreviations CC and NC for the carbonaceous chondrite and non-carbonaceous groups, respectively, perhaps because they tired of typing long words (as did your PSRD author). Burkhardt plotted ε 95Mo (deviation in parts per thousand of the 95Mo/96Mo from the standard terrestrial value) against ε94Mo (deviation in parts per thousand of the 94Mo/96Mo from the standard terrestrial value). They found two distinct lines on this plot. Both spread out along their lines due to different amounts of s-process nucleosynthesis products, with the CC group having a larger spread along the line and generally higher values of both isotope parameters. The authors ascribe the offset to different abundances of isotopes produced by r-process nucleosynthesis. In other words, the groups are different and the difference seems to be related to different mixtures of the products of element formation in massive stars that no longer exist. Molybdenum isotopic compositions of samples of CC (carbonaceous) and NC (non-carbonaceous) meteorites, including iron meteorites, differentiated rocky meteorites, and chondrites. 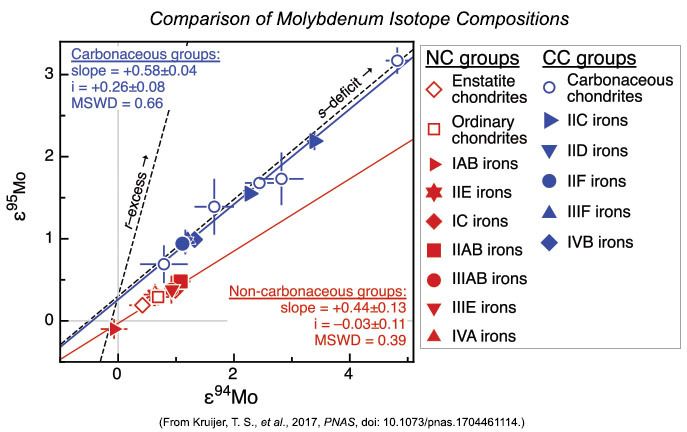 The data (which includes data from the earlier paper by Burkhardt and coworkers) show two distinct lines for the two major groupings, extending the observations made by Paul Warren to molybdenum isotopes and iron meteorites. The dashed lines represent trends expected from differing amounts of isotopes produced by s-process and r-process nucleosynthesis in massive stars. 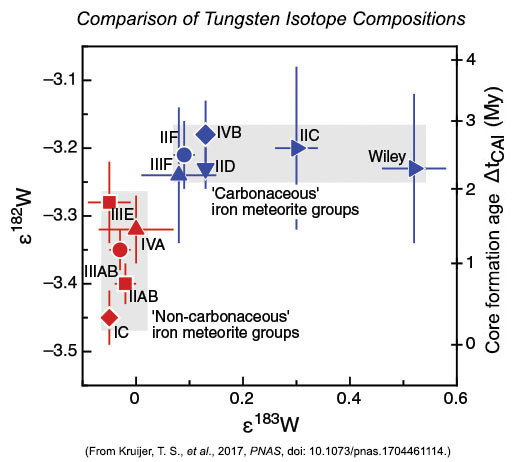 Thomas Kruijer and colleagues also measured tungsten isotopic compositions. These are informative because they may have variability due to variable amounts of nucleosynthesis products and contain important information about the formation times of iron meteorites (see next section). They also measured platinum isotopic composition to correct for 182W production by bombardment by cosmic rays in space, and molybdenum isotopes to add to the database. The analyses required cleaning the samples in dilute acid to remove terrestrial contamination, dissolving each sample in concentrated acid solutions, and separating the tungsten, molybdenum, and platinum by anion exchange chromatography. Finally, the isotope abundances were measured by mass spectrometry using an instrument with the ultra-scientific name ThermoScientific Neptune Plus High Resolution Multicollector ICP-MS. The ICP-MS stands for inductively-coupled plasma mass spectrometer (see PSRD article: ICP-MS and Planetary Geosciences). The tungsten isotopic compositions appear in the diagram below, again in epsilon notation. In this case, it involves the ratios 182W/184W and 183W/184W, normalized to those ratios in the Earth. The data once again fall into the CC and NC groups. The newly analyzed iron meteorite types fall into one group or the other, firming up the idea that the CC and NC groups formed in different parts of the Solar System. The range in the ε183W value (x-axis) is caused by differing amounts of nucleosynthetic 183W. The range in ε182W (left side y-axis) results from the two groups having different times at which iron meteorites formed during melting of planetesimals. The CC-NC dichotomy shows up in tungsten isotopes, too. Kruijer and coworkers attribute the variation along the x-axis in ε183W to differing contributions from nucleosynthetic sources. Delay in the timing of core formation caused the variations in ε182W. The inferred time of core formation (relative to the age of the first solids to form in the Solar System, the CAIs) appears on the right-side y-axis. The 182W difference occurs because 182W forms in part by decay of radioactive 182Hf (hafnium), a short-lived isotope. When core formation happens, 182W no longer increases because hafnium stays in the rocky part of the body and tungsten goes into the metallic core. Thus, the higher the ε182W, the longer it took to form the core. The NC group (red symbols) formed before the CC group (blue symbols). Timing is important in cosmochemistry, which is one of the motivations in measuring tungsten isotopic composition. Some of the 182W forms by decay of radioactive 182Hf (hafnium), which has a half-life of only 9 million years. This short half-life means that 182Hf no longer exists in the Solar System. It also means that it is a sensitive chronometer for dating events in the early Solar System. It is particularly useful for dating core formation because hafnium does not go into metallic iron, but tungsten does. Thus, before a planetesimal was heated enough to melt metallic iron, the 182W increases in the body as 182Hf decays. When the core forms, all the tungsten goes into the metallic iron, leaving behind the hafnium. 182W increases in the rocky mantle above the core, but the amount of 182W does not change inside the core, preserving a record of when it formed from decay of 182Hf. For more details and an indication of some of the complexities, see PSRD article: Hafnium, Tungsten, and the Differentiation of the Moon and Mars. Using radioactive decay equations and assuming that the initial 182W was equal to that measured in calcium-aluminum-rich inclusions (CAIs) and that the elemental Hf/W ratio was the value observed in chondrites, Kruijer and colleagues were able to determine the time of core formation in the planetesimals in which iron meteorites formed. They calculate that CC iron meteorites formed 2.2 to 2.8 million years after CAI formation, whereas the NC iron meteorites formed earlier, 0.3 to 1.8 million years after CAIs. However, this only gives the time of core formation, not the time when the planetesimals formed because the objects formed cold and had to heat up by the decay of short-lived aluminum-26. 26Al has a half-life of 700,000 years. Determining the heating time to melting requires some assumptions, such as the aluminum content (the more aluminum, the more 26Al). The thermal history calculations suggest that the planetesimals in which the NC iron meteorites formed accreted first, around 0.4 million years after CAIs. The CC iron parent bodies formed a bit later (consistent with their younger ages of core formation), around 0.9 million years after CAIs. Thus, between the time the NC parent bodies accreted and the time the CC parent bodies accreted, the NC and CC isotopic reservoirs must have formed, but mixing between them had stopped. Furthermore, the chondrite bodies in both groups formed after the iron meteorite parent bodies, around 2 million years after CAIs, according to dating using the abundance of 26Al. (It had to be at least a couple of half-lives of 26Al to prevent melting of the chondrite bodies.) This provides further evidence that the two reservoirs coexisted but had stopped mixing. Why did the mixing stop? Building on published models of Jupiter's formation and subsequent inward and outward movement, dubbed the Grand Tack model by Kevin Walsh (Southwest Research Institute, Boulder) and colleagues, Kruijer and coworkers suggest the formation of Jupiter created a barrier to mixing. Stage 1: During the first 0.4 million years the NC iron meteorite parent bodies (represented by filled red circles) accreted from the dusty disk. A chief feature of the disk at this time was that gas drag caused an inward flow of dusty solids. The CC reservoir had not formed yet and nothing blocked the flow of gas from far beyond Jupiter towards the inner part of the disk. Stage 2: By about one million years after CAIs, two important events had happened: Jupiter had grown to 20 Earth masses, preventing inwards migration of solids, and the CC iron meteorite bodies had accreted (filled blue circles). This implies that formation of Jupiter's solid core took only one million years. Stage 3: During the period 2 to 4 million years after CAI, Jupiter grew by accreting gases. NC chondrites parent bodies (open red circles) accreted in both the inner part of the disk while CC chondrite parent bodies (open blue circles) accreted in the region of the disk beyond Jupiter. Stage 4: By about 4 million years after CAIs, Jupiter is bigger than 50 Earth masses and its migration creates a gap in the disk. Modeling studies are interesting and an important guide to planet formation. However, the time for Jupiter to reach a significant mass to be able to accrete the massive amounts of gas to enable it to qualify as a gas giant was estimated to be less than 10 million years—but how much less? Now, using data from meteorites, Thomas Kruijer and his colleagues show that the formation time for Jupiter's core is 1 million years. Jupiter's growth in the disk surrounding the growing Sun can be depicted in four stages, though the whole process is, of course, continuous. It starts with a disk of dust and gas, with gas drag leading to a flow of dust inwards. NC iron meteorite parent bodies form first (Stage 1) followed by formation of the CC iron meteorite parent bodies (Stage 2) and the growth of Jupiter's rocky core, which grew to 20 times the mass of the Earth. Jupiter's formation caused the inward flow of dust to cease, allowing the NC and CC isotopic reservoirs to remain separated. Chondrite parent bodies formed as Jupiter continued to grow by gas accretion (Stages 3 and 4), and the two reservoirs remained separate entities. So, we have two distinctive places in our Solar System, with no mixing between them, so how did we get samples from both regions? The answer is that nothing is completely stable in our Solar System. As Jupiter grew, it migrated inwards, scattering planetesimals and mixing things up. Bodies from both the CC and NC reservoirs ended up in the asteroid belt. Eventually, by assorted impacts and gravitational perturbations, pieces of them traveled to Earth, giving cosmochemists insight into the first few million years of our Solar System. PSRDpresents: Meteorite Formation Times and the Age of Jupiter -- Short Slide Summary (with accompanying notes). Burkhardt, C., Kleine, T., Oberli, F., Pack, A., Bourdon, B., Wieler, R. (2011) Molybdenum Isotope Anomalies in Meteorites: Constraints on Solar Nebula Evolution and Origin of the Earth, Earth and Planetary Science Letters, v. 312, p. 390-400. Davenport, J. D. (January 2014) ICP-MS and Planetary Geosciences, Planetary Science Research Discoveries, http://www.psrd.hawaii.edu/Jan14/ICP-MS-HowItWorks.html. Taylor, G. J. (November, 2003) Hafnium, Tungsten, and the Differentiation of the Moon and Mars, Planetary Science Research Discoveries, http://www.psrd.hawaii.edu/Nov03/Hf-W.html.